Regardless of the fact how much money you have, how often you have your cleaning lady come over or how many times you want to clean your home a week, there is always the same issue with all those things – it takes time and you always have something better to do with that time. Therefore, it is just the perfect moment to talk about a little time management in order to make that cleaning process go quicker and smoother. 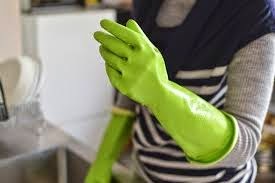 It is all about good organization around your home once toy put on those yellow gloves and get to work. In most cases, you want to be as thorough as possible and once you finish with all the cleaning, you want to entire home to sparkle, just like in those commercials for cleaning products. However, in reality, you start from one part of the room, just to get bored and tired in no time, leaving parts of your home entirely untouched. Therefore, it is wise to forget about cleaning from one room to another and plan the work you are about to do task by task and go over the entire home. In that way, even if you get tired, you will still have at least some work done at every corner in the home. For example, dusting. Don’t dust just the bookshelf and focus on it until it is spotless and all fixed. Dust the entire home, then wash all the floors and then move on to the next task that will cover the entire home. Figure out what you want to get done and which processes need to be done. For example, you want to wash the dishes, but you also need to clean the toilet. In order to save time, try applying the chemicals you use on the toiled, bathtub and the entire bathroom and leave them do their work while you sink the dishes in warm water and continue dusting. While you dust the entire home, the dishes and the toilet will be very easy to clean in just a couple of wipes from your behalf. It is like doing more things at the same time when you are actually just planning it ahead and letting the chemistry work for you. This means that you will need to have enough cleaning agents, protective ‘gear’ and all the appliances that you need. Make sure that you have everything, or running away to the store will definitely increase the time needed to finish up cleaning in the record time. Also, if you think this more thoroughly, you will see that there are appliances that will speed the whole thing up and make your cleaning even better. For example, having one of those domestic steam cleaners means that you will not have to spend time scrubbing and scraping off some persistent dirty spots as the steam will take care of it very quickly and thoroughly. It will also replace all the hard chemicals because the bacteria don’t survive the high temperatures the steam cleaners work on. Another very important thing is to make a list of actions in the correct order. If you are about to clean the whole home, it is best that you do it task by task but also make sure that you don’t double up your work. For example, don’t scrub the floors and then dust the shelves because your floors will be covered with dust once you finish them. Doubling up the work is boring, time consuming and it can be prevented. ketinggian tempat yang harus di bersihkan yanga da di dalam rumah tentu harus dilakukan minimal 6 bulan sekali, untuk itu haruslah di siapkan sebuah tangga, boleh juga bikin tangganya dari bahan bambu, lebih ramah lingkungan. Thank you for sharing! You gave me some ideas ! Making a plan before cleaning is a very important part of the process!